Let your little one have fun learning to build circuits with these colorful Electronic Snap Circuits. Each one features more than 60 parts that easily snap together. 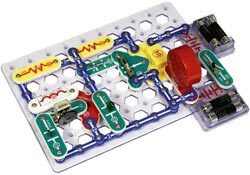 The snap circuits toy can be used to make interesting circuits, encouraging educational play that teaches your little one about electricity. All of the parts have colored graphics that represent their real electronic names and symbols. This educational toy comes with a complete instruction manual and project guide that helps you to guide your child through exploring over 300 experiments. Some of the projects include making circuits for doorbells, radios, alarms, flash lights, laser light, street lamps, a lie detector and a fan modulator. This kids' snap circuits toy runs on four AA batteries that are sold separately. It is ideal for children age 8 years and older. Give your child an exciting, hands-on introduction to electronics with Elenco Electronics Snap Circuits SC-300. This kit contains over 60 color-coded, real circuit components that snap together to create working electronic circuits and devices. Recommended for children 8 and older, this set offers 305 do-it-yourself projects that will give your child an entertaining, concrete education on how electronics work. Build 305 different electronic projects. View larger. Snap Circuits comes with over 60 pieces to create 305 different electronic projects. The pieces, which include snap wires, a slide switch, a resistor, a microphone, and capacitors, snap together easily onto the included plastic grid--no soldering required. Each piece is numbered and color-coded to make identifying them easy. These components combine to create working circuit boards just like the ones found inside televisions, radios, and other electronic devices. 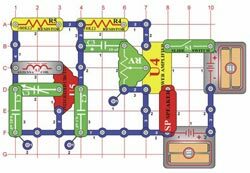 With its easy-to-follow instructions, Snap Circuits gives your child a hands-on education in how electrical circuits run the everyday devices that they're familiar with. They'll also gain valuable lessons in building and in following instructions. The project manuals include large color illustrations and simple directions for each project. The project list includes all of the projects included in the SC-100 set and 204 additional projects, including a photosensitive electronic organ, a lie detector, an AM radio, and a two-finger touch lamp. With these projects, children will experiment with electric switches, integrated circuits, digital circuits, fuses, and the transformation of circuit sounds into other sounds. Because the projects are arranged in order of complexity, kids can build on their skills as they progress through the manual. The lessons start out with a simple electric light and switch project that demonstrates how electricity is turned on and off with a switch. Further along, kids can put together a fire fan symphony, a water-detection alarm, a delayed-action fan, and more. Once children have mastered several of the techniques introduced in this kit, they can use the components to experiment and create their own customized circuits and electronic devices. The Snap Circuits SC-300 can also be upgraded to the Snap Circuits Pro, Snap Circuits Extreme, or SCM-400 with the purchase of a UC-50, UC-70, or UC-100 upgrade kit, respectively. Kids will enjoy additional parts, manuals, and projects that'll take their kit--and their fun--to the next level. Snap Circuits SC-300 requires four AA batteries, which are not included.